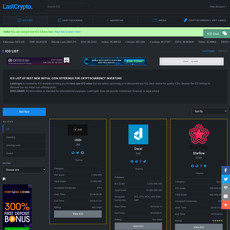 6+ Cryptocurrency and Bitcoin Tradingviews - Cryptolinks - The World's Best Cryptocurrency Sites List! Traders source of information and discussion can have a big impact on their performance. 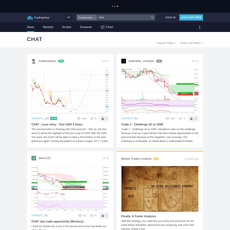 The crypto trade chats category reviews some of the most popular online forums and channels traders access to discuss ideas, peer review projects, and learn. This category includes six of the most popular platforms which enable traders to participate in the discussion. Not all of them are exclusively related to crypto but all facilitate crypto-related discussion. The chat rooms focus on different areas. Some of the chat rooms focus on technical analysis, some on ICO investing, technology, general investing discussion, and more. TradingView, for example, is one of the most popular resources for traders wishing to conduct technical analyses. There platform and software enable traders to conduct analysis on a wide variety of products with a wide variety of technical analysis tools. Some of the products include equities, forex, and cryptocurrencies. As part of their service, they also enable traders to post ideas and other traders can comment and discuss the ideas. This enables traders to build up a reputation in the industry for well-thought-out ideas. Other chat rooms venture beyond just technical analysis. The Bitcoin Core will involve technical discussion that may be important to investment decision making. ICO talk is solely focused on ICO analysis. 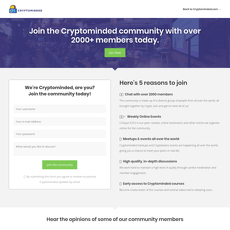 Cryptominded facilitates general cryptocurrency discussion. The key subject will be noted in the reviews so that readers can assess whether the specific chat rooms deal with what they are looking for. Some speculators are also willing to pay a price to access the correct trading chats if they believe they can get value from them. 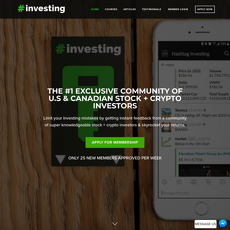 The popular Hashtag investing included in the reviews is a premium service and details will be included in the reviews related to chat rooms which need to be paid for. However, most of the products remain free but this can sometimes lead to low-quality posts. For this reason, many of the products included in this category include a screening process where they assess users before joining the chat room to ensure high-quality discussion is maintained. For example, the Bitcoin Core community make users fill out a form before being invited to join. All of these points will be noted in our reviews. It will be clear which chat rooms screen members before entering and what can be expected in terms of quality of discussion. Moderation of trading chat rooms needs to strike a healthy balance. Free and open discussion of ideas, trades, and research needs to be facilitated but it cannot reach the point where individuals are able to spam and use the chat room as a resource to link to their businesses. When it gets to this point, the value is typically drastically diminished from the chat room. An overview of the quality of moderation is included in these reviews. It will highlight if particular chat rooms have a tendency for spam links and low-quality discussion. With cryptocurrencies being an early market, users participating in these chat rooms also need to exercise caution and avoid links from those looking to steal funds or promote questionable projects. For this reason, chat rooms which facilitate more spam links to be shared will receive lower star ratings. This is one of the key metrics taken into account when rating projects. The facilitators of the discussion will have a big role to play. Many of the services have analysts on board the team who play a key role in starting, facilitating, and moderating discussions. 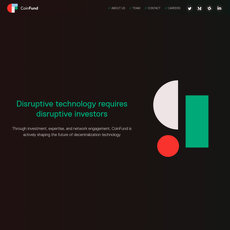 Coinfund takes this area very seriously and has a multidisciplinary team as the staff that contribute to valuable discussions in a wide variety of ways. Their team includes engineers, research analysts, scientists, and more. ICO talk also includes ICO analysts who review the projects. These reviews will note what can be expected in terms of the contributing team. Just as important as the discussion from the team is the activity from the community that takes place in the chat rooms. A valuable discussion involves constructive contributions from many different members. A lack of activity takes the value away from chat rooms. For this reason, the reviews also point out which chat rooms lack activity and do not have as much to offer traders in terms of value. Some reviews will indicate approximate numbers in terms of the size of the community. Overall, trading chat rooms play an important role in markets. It can be difficult for market participants to find the right resource where valuable discussions take place. Certain market participants are also seeking certain types of content and may need to sift through many irrelevant subjects before finding what they were looking. These reviews aim to streamline the process so that readers can know at a glance the key content they can expect from a chat room. They can gauge the content of discussions, the quality of discussion, the level of moderation, the pricing, and know the key strengths and weaknesses.